back to "The Story of the Mask"
Together with speech and gestures, facial expressions are man’s main natural and original means of communication. Facial expressions highlight, conceal or, depending on the occasion, mislead messages conveyed by speech and gestures. When people deliberately hide their faces from outsiders, they experience something fascinating and ambiguous, something which is extremely difficult to describe clearly and comprehensibly. At the same time such an experience may be both emancipating and frightening, strangely fascinating and oppressive. At any rate, the experience is associated with a Feeling of power, a feeling which can be described as originating from the knowledge that controls the message and avoids unintentional and revealing expressions which would enable more to be read into a message than intended. In an expressive sense, a face can be concealed in many ways. It can try to appear as an impenetrable stone face or conjure up a representative expression to suit the occasion. Sun glasses, make-up and decoration etc. may be worn. The face may also be concealed as a means of protection from external conditions. In the latter case, this may also relate to earlier feelings and experiences introduced. On the one hand, concealing the face is masquerading and at the same time a traditional way of hiding, of retaining anonymity. On the other hand, it is an effective means of conveying unambiguous matters to the outside world. A mask itself may be both a physical object worn over the face or a material or expression behind which you conceal that which you do not want those present to notice. The belief that a person is what he appears does not just give mask wearers a new anonymous face, it also gives them a new personality. 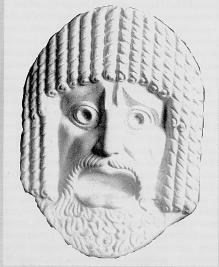 From an outsider’s point of view, the loss of personality originally connected to wearing a mask is perhaps more important as an object of anonymity than from the perspective of the wearer himself. A mask also provides an inverse opportunity to reveal the real ego, free from the bonds of social norms and rules of behavior and the everyday mask. Throughout history masks have been made of all possible, and impossible, types of material such as wood, metal, stone, straw, reed, leather, bone, horn, feathers, paper, etc. Masks have been made from virtually every material imaginable which can be worked by hand or tool. Mask use, the materials and tools available, and the prevailing traditions have dictated the choice of material. Even in this modem age of artificial fibres, the working methods and application of materials developed over thousands of years are still used when making masks. Masks have played an essential part in prehistoric man’ s various rituals connected with cults, hunting, story telling, conveying messages and confirming tribal identity. A mask has also served to highlight its wearer’s position in the social hierarchy. The habit of wearing masks on different occasions may originally have arisen quite simply from a need to protect against the affect of the climate, the sun or from a desire to scare enemies. All in all the saying that a mask has two sides is an extremely clear description of the ambiguity of the topic. On the one hand, concealment, protection and its importance, on the other, communication and revealment. A mask usually makes it possible to simplify and clarify an expression or message, and above all gets the message across more effectively. A soldier’s helmet was more than just a protection device. It also had an equally important function, that of conveying its wearer’s bravery and power to the enemy. In other words it functioned just like a mask. Throughout history wearing a mask has taken on many various forms which often seem to have little connection with ancient rituals. Deep down, however, the issue stems from the same need to protect. In the end this need manifests itself as masquerading or wearing a mask on different occasions. Death masks were used in many cultures before the beginning of our chronology, both in the old and new continents. Among other things, the ancient Egyptians were in the habit of dressing persons of noble birth in splendid masks before burial. These masks preserved and protected the deceased from impending dangers on their journey to the kingdom of the dead. Masks also played an important role in national festivities such as carnivals, which where often linked to religious rituals performed at certain times of the year. It is impossible whit any degree of accuracy to ascertain when ancient rituals and cult ceremonies changed, or when carnivals, theatre and other situations and events requiring the use of masks to dispel everyday reality and uplift the spirit, developed alongside them. The aforementioned enabled a society's strict social hierarchy to lapse for a fixed period and gave room for critical laughter and fun at the expense of those in power, thus functioning as a kind of social safety valve. 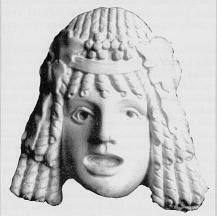 As theatre proper developed in ancient Greece, the mask had a major role in performances. 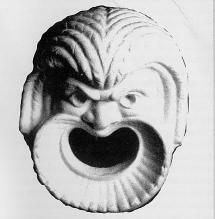 According to some researchers, this role was not just limited to conveying the visual message of the the character played by the actor wearing the mask, it has also been claimed that the mask served as a kind of megaphone in large outdoor theatres. 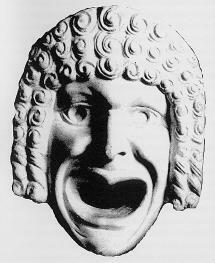 The mask has been and continues to be an essential part of theatrical expression throughout the world. It might be a skilfully carved wooden mask worn in traditional Chinese opera or a character image produced with the help of make up and requisites as in modem western theatre. One reason for the mask’s popularity, especially in theatre, can be that the public prefers to see well-known popular actors playing their familiar successful roles than experience a novel aspect by an unknown performer which takes time and effort to get accustomed to. In this sense, the mask represents a lasting, successfully proven tradition which, at the same time, as if guarantees quality, thus sparing the public from disappointment. In a certain sense, modem man uses a mask continuously, in fact often without being aware of the reasons for doing so. Sophisticated behavioural patterns and norms developed throughout the ages are so deeply imbedded in our subconsciousness that we no longer remember their original! meaning. The presence of theatrical and dramatic elements in all human interaction, in politics, sport, etc. works in just the same way as a mask and results from a desire to clarify a message, to ensure that what is said is understood and, at the same time, to try and conceal those factors detrimental to the message. Everyday masquerading, customs, make-up, decoration, etc. conveys a message in the same way as strange behaviour rituals from the original consciousness.